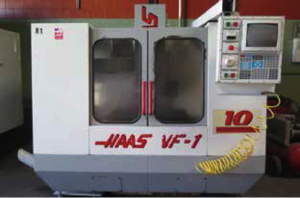 1995 Haas VF-1 4-Axis CNC Vertical Machining Center s/n 5750 w/ Haas Controls, 20-Station ATC 40-Taper Spindle, 10Hp Motor, Programmable Coolant Nozzle, Chip Auger, Coolant. Fadal VMC6030HT CNC Vertical Machining Center (NEEDS REPAIR) s/n 8811854 w/ Fadal CNC88 Controls, 21-Station ATC, 40-Taper Spindle, 30” x 63” Table, Coolant. Bridgeport V2XT 3-Axis CNC Vertical Mill w/ Bridgeport CNC Controls, Rapid-8 Power Drawbar, Chrome Ways, 9” x 48” Table. Maho mdl. MH600E CNC Universal Mill w/ CNC432 Controls, Vertical Milling Head, 40-Taper Spindles, 18” x 35 ½” Table. 1999 Komo “Mach ONE” Innova 510 CNC Router s/n 26619-03-01-99 w/ Komo Controls, Hand Wheel, 8-Station ATC, BT-30 Taper Spindle, 5’ x 10’ Table, 3978 Metered Hours. Hardinge ST-225 Twin Spindle CNC Screw Machine s/n 142-25 w/ GE-Fanuc 18-T Controls, 6-Rigid Turning Stations, 4-Back Drill/Boring Stations, 3-Cross Drilling Stations, Parts Chute, (NO COOLANT OR CHIP TRAY). Hardinge ST-220 Twin Spindle CNC Screw Machines/n 0008220 w/ GE-Fanuc 18-T Controls, 6-Rigid Turning Stations, 4-Back Drill/Boring Stations, 3-Cross Drilling Stations, Parts Chute, (NO COOLANT OR CHIP TRAY). 2007 ANG mdl. JH-CK6135 CNC Lathe s/n 3123 w/ GSK 980TD Controls, 4-Station Auto-Indexable Tool Post, 5C Collet Nose, Coolant. Takamaz mdl. EX-50 CNC Turning Center s/n 471753 w/ Takamaz-Fanuc Controls, 8-Station Turret, 16C Collet Nose. Clausing / Metosa “Auto Lathe” EL1565CS 15” x 65” CNC Gap Bed Lathe s/n 31785 w/ Fagor Controls, 8-Station Turret, 0-2300 RPM, Tailstock, 8” 3-Jaw Chuck, Coolant. Miyano BNC-34S Twin Spindle CNC Turning Center s/n BN30301S w/ Fanuc 0T Controls, 6-Station Turret, Front and Rear Tooling, Pneumatic Parts Loader (NEEDS CONTROL BOARD). Hitachi H-CUT203M CNC Wire EDM Machine s/n D310739001 w/ Fanuc System HF Controls, 10” x 14” Work Area, Coolant and Filtration System. Acra Vertical Mill w/ Sargon DRO, 3Hp Motor, 70-4200 Dial RPM, Chrome Box Ways, Power Feed, 10” x 54” Table. SIP MP-3K Bridge Style Jig Boring Machine s/n 6507 w/ Mitutoyo DRO, 75-2000 RPM, Power Feeds. Conrac mdl. 72B Hydraulic Pipe Bender s/n 4018-101 w/ Conrac Controls, 3 ½” x .120” Wall Cap, 17’ Extended Bed Length. Cincinnati 135CB II x 8 135 Ton x 10’ CNC Hydraulic Press Brake s/n 50783 w/ Cincinnati Controls, 14” Stroke, 12 ½” Throat, 10’ Bed Length, 102” Between Uprights, Light Curtain. Niagara IB-65- 6-8 65/100 Ton x 8’ CNC Press Brake s/n 49724 w/ Autobend 5 Controls, 3” Stroke 5”Motorized Ram Adjustment, 8 ¼” Throat, 78” Between Uprights. Roto-Die mdl. 10 10’ Hydraulic Bender s/n 81287 w/ Back Gage Arms. Chicago Size 131 15 Ton x 48” Press Brake s/n LW6974 w/ 6 ¼” Throat. Chicago Size 135 15 Ton x 48” Press Brake s/n L-17567 w/ Back Gage. W.A. Whitney mdl. 635A Production Punch Press s/n 635-020- 24069 w/ 9/16” thru ½”, 2” thru ¼”, 3” thru 3/16”, 5” thru 10GA (.135”) Cap. Hoffman mdl. 7500 75” Double-Sided Lapping Machine w/ Allen Bradley PanelView 600 PLC Controls. 2000 G &amp; N “MPS2 R300S” mdl. MPS2-300S Rotary Surface Grinder s/n 514647 w/ 11 ½” Rotary Table, (2) 6” Sub-Tables, Diamond Grinding Wheel, Coolant. Timesavers mdl. 325-1 25” Belt Grainer s/n 7947 w/ Newall A50 DRO, Belt Feed. Boyar Schultz Challenger HR-618 6” x 18” Surface Grinder w/ Walker Fine-Line Electromagnetic Chuck. K.O. Lee mmdl. SB818 8” x 18” Surface Grinder (NO MAGNETIC CHUCK). Taft-Peirce 6” x 12” Surface Grinder w/ Sony DRO’s, Walker Electromagnetic Chuck (NEEDS WORK). 2000 Kasto Type “Kasto Twin A4” Twin Beam 16” Hydraulic Horizontal Band Saw s/n 6428 103 034 w/ PLC Controls, Coolant (NEEDS WORK). Ramco mdl. RS-90P 9”” Horizontal Band Saw s/n 009003. Johnson mdl. J 9” Horizontal Band Saw s/n 9085. Kalamazoo mdl. 8-C- W 8” Horizontal Band Saw s/n 3491953. FJC Heated Wash Line w/ 30” x 24” Cap, Heaters, Pumps and Blowers. (2) Ingersoll Rand SSR-EP75 75Hp Rotary Air Compressors s/n CK6498U05020, CK6109U04098 w/ 332 CFM @ 125 PSIG. Ingersoll Rand TS2A and TS1A Refrigerated Air Dryers. Wuincy mdl. OSVI40ANN3H 40Hp Vacuum Compressor s/n 96423H. GA Genspark America mdl. CY20 Die Sinker EDM Machine s/n 601083 w/ Sargon DRO (NO POWER SOURCE). York mdl. B3CH048A25B Air Conditioning Unit 208/230-3- 60. Abus 2 Ton Cap Crane Hoist.CM, Loadstar, Coffing and Quantum Electric Hoists. Schreiber “True Ton” mdl. APS300AC Water Chiller s/n 412. (2) Landa OHW4-2000 Heated Pressure Washers Kerosene//Diesel Fired. (2) Coleman 5000 Watt Gas Powered Generators. Electric Motors. EnerSys mdl. WG3-18- 865 36 Volt 18-Cell Battery Charger. Miller Deltaweld 302 CV-DC Arc Welding Power Source s/n LB078945 w/Miller 60 Series Wire Feeder. Lincoln Power MIG 300 MIG Welding Power Source s/n 1020348397. Miller CP-250TS CP-DC Arc Welding Power Source s/n HE782609 w/Miller S-52E Wire Feeder. Miller CP-250TS CP-DC Arc Welding Power Source s/n 72-622994 w/Miller 10-E Wire Feeder. Miller CP-250TS CP-DC Arc Welding Power Source s/n KE556298 e/Miller Wire Feeder. Miller SRH-222 DC Arc Welding Power Source s/n HH050070. Miller Millermatic 35 CP-DC Arc Welding Power Source. Hypertherm MAX40CS Plasma Power Source. TRW Series 4000 mdl. 101 Nelson Stud Welder. Acme Type 2-24- 30 30kVA Spot Welder s/n 9811. Hyster 50 Fortis mdl. S50FT 5000 Lb Cap LPG Forklift s/n F187V04523C w/ 3-Stage Mast, 189” Lift Height,Side Shift, Solid Tires. Hyster 50 Fortis mdl. S50FT 5000 Lb Cap LPG Forklift s/n F187V04522C w/ 3-Stage Mast, 189” Lift Height, Side Shift, Solid Tires. Komatsu FG15S 3000 Lb Cap LPG Forklift s/n 60686 w/ 2-Stage Mast, 130” Lift Height, Cushion Tires. Caterpillar T30D 2650 Lb Cap LPG Forklift s/n 5GB07168 w/ 3-Stage Mast, Cushion Tires. Toyota LPG Powered Yard Dog w/ Tow Hitches, Push Bumpers.